Hangmen follows Harry Wade (David Morrissey), the second most famous executioner in the country, who now works as a pub landlord in Oldham. Things begin to sour for the retired hangman and his wife Alice (Sally Rogers) when a mysterious man named Peter Mooney (Johnny Flynn) appears at the hotel. Also starring Josef Davies, James Dryden, Tony Hirst, John Hodgkinson, Bronwyn James, Andy Nyman and Craig Parkinson, the creative team includes set and costume design by Anna Fleischle, lighting by Joshua Carr and sound by Ian Dickinson. 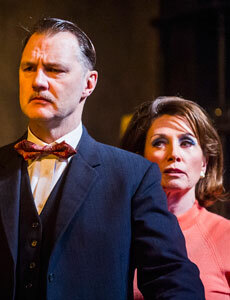 Hangmen plays at Wyndham’s Theatre until March 5 2016. “It’s writing of the highest order, immaculately served by name-to-watch director Matthew Dunster, and it continues as the narrative moves into darker terrain, with the blackest of lines turning on a sixpence of humour,” she said. Mountford adds the “much deserved” West End transfer sees Morrissey as the production’s lead deliver “commanding work”, who “makes Wade irascible and dyspeptic”. Natasha Tripney’s four-star review in The Stage  also praises McDonagh’s writing as a “triumphant transfer” – a “pitch-black comedy” that’s “tightly constructed”. “McDonagh’s skill at this sort of material becomes even clearer on a second viewing,” she writes. Publishing a five-star review in the Telegraph , Ben Lawrence observes “the best new play” of 2015 is “an extraordinarily truthful portrait of Sixties Britain”, which has been envisioned as “an ugly place where divides… are drawn up with unquestioning intolerance”. 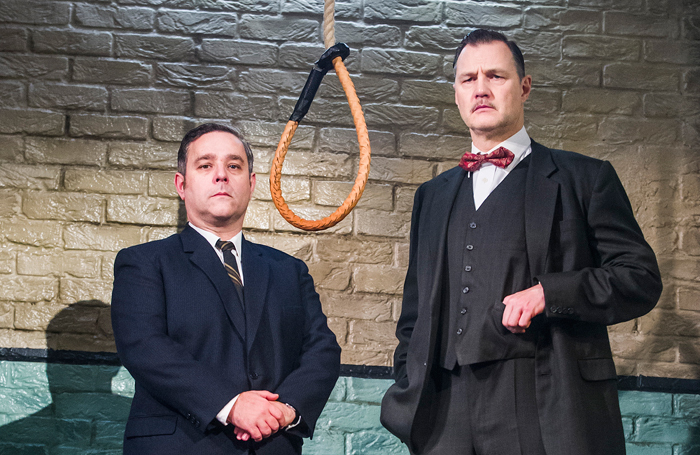 He praises the way Hangmen “cranks up the tension”, moving towards a “meticulously structured” second act which “plays out like a black farce” while allowing the “excellent cast” to “hint at hidden depths beneath the snazzy, rapid-fire dialogue”. How killing in the name of justice changes the way we value life is one of the central themes permeating throughout the production, according to critic Daisy Bowie-Sell in her four-star review for WhatsOnStage . “They are questions explored through the angry, straight-backed, laughable, bow-tied Harry, who is probably the last person you’d want there on your day of reckoning,” she said. Across the controversial subject matter of capital punishment, Bowie-Sell says the “genuine thrill” of Hangmen is sustained throughout by the efforts of the cast. “Andy Nyman… is very good. He plays it less for the comedy and as a result he is more convincing as the man with a grudge and a flawed plan,” she said. “Morrissey gives an excellent, even-handed performance, managing to be both convinced of his own worth and entirely ridiculous at the same time. He delivers the humour with a dead-pan assurance. 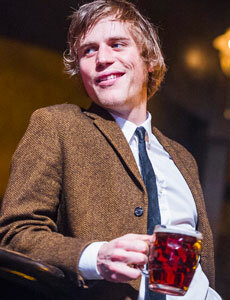 “But it’s Johnny Flynn who makes Hangmen such fun. He is a remarkable fit to the oddball Peter, giving a performance that is supremely uncomfortable to watch. It’s a hilariously unpredictable turn that gives Hangmen its black heart. In a four-star review published on West End Frame , Andrew Tomlins was surprised to find himself “laughing out loud” given he had “anticipated something of a grisly evening”. “McDonagh’s play is wickedly funny,” he writes. Like Bowie-Sell, Marianka Swain singles out Johnny Flynn as one of the very best things about Hangmen in her four-star review  published on The Arts Desk. “The tour-de-force performance comes from Johnny Flynn as mysterious Southerner Mooney, the cocky agent of chaos who challenges Wade’s supremacy,” she writes. “Is he the manifestation of Hennessy’s curse, the instrument of bloody revenge, a bully, a murderer, or merely a prosaic prankster? “Through the exhilarating U-turns, it becomes clear that truth is less important than how he’s perceived, and what kind of response that warrants. Swain also cites Fleischle’s “spectacular” multi-level set for how it “whisks away a dismal prison cell to reveal the brown time warp of a pub, trapped in a fog of cigarette smoke”. “It’s as visually precise as McDonagh’s exquisite semantic dissection. Never has the difference between “vaguely” and “definitely” promised – and delivered – such a rousing denouement”. Camody Wilson is also a fan of the “brilliant” design in her three-star review  published in The Big Issue. “Special mention must go to set designer Anna Fleischle for her dark, atmospheric and surprising set,” she writes. But while McDonagh’s films In Bruges and Seven Psychopaths have generated widespread accolades, Wilson said Hangmen is a “hit and miss” play which “falls apart in the second act”. Quentin Letts explains in his four-star wrap for The Daily Mail  he “rarely felt like joining in the laughter” in a production that is “easier to admire than to love”. “Many lines depend on shock value – the alleged ugliness of prostitutes in Scotland, for instance. Excuse me if I do not roar with mirth,” he said.